The Mandurah Artificial Reef has been deployed. At a total cost of just over $1.1 million, the reef is the first in Western Australia to be solely paid for by the recreational fishing community. The reefs were funded through the Recreational Fishing Initiatives Fund by recreational fishing licence fees. The purpose-built reef consists of 30 cubic reinforced concrete modules, arranged in clusters of five modules. Each module is 3m x 3m x 3m, weighs 10 tonnes, has a surface area of 30m2 and has an internal volume of 27m3. The module design is the same as those used in the south west artificial reefs, being a hollow cube with curved cross braces. The design is aimed to promote upwelling (bringing nutrient rich water from the sea floor to the surface creating phytoplankton and zooplankton blooms, providing the basis for productive food chains) as well as create varied complex spaces and habitats which act as shelter for fish. The reef is located 9km from shore being easily accessible for boats leaving from the Mandurah Estuary mouth or the Dawesville Cut. In 25m depth the reef is spread across four hectares of barren desert-like seafloor which had little marine life prior to reef deployment. The deployment of the reefs, announced by the Fisheries Minister, the Honourable Joe Francis MLA, was the last stage of a long community driven process to get the reefs in the water. Both Port Bouvard Recreation and Sporting Club as well as the Mandurah Offshore Fishing and Sailing Club (MOFSC) consulted with Recfishwest on reef location with volunteers from MOFSC even dropping cameras to the seafloor to find the ideal site characteristics for the reef. Strong support also came from local MP and keen fisher, the Honourable Dr Kim Hames. The reef had support from a large amount of stakeholder organisations including the Western Australian Department of Fisheries, City of Mandurah, Tourism WA and the Mandurah and Peel Tourism Organisation as well as many others. With the same modules in a similar depth to the successful south west artificial reefs, the Mandurah Artificial Reef is expected to develop into a complex marine habitat supporting a diverse fish community providing fishing opportunities for iconic species such as Pink Snapper, Skippy, Dhufish, Baldchin Groper and Samson Fish. Prior to the deployment of the Dunsborough and Bunbury artificial reefs only a dozen fish species were identified at the deployment locations. Three years later over 60 species have called these reefs home. 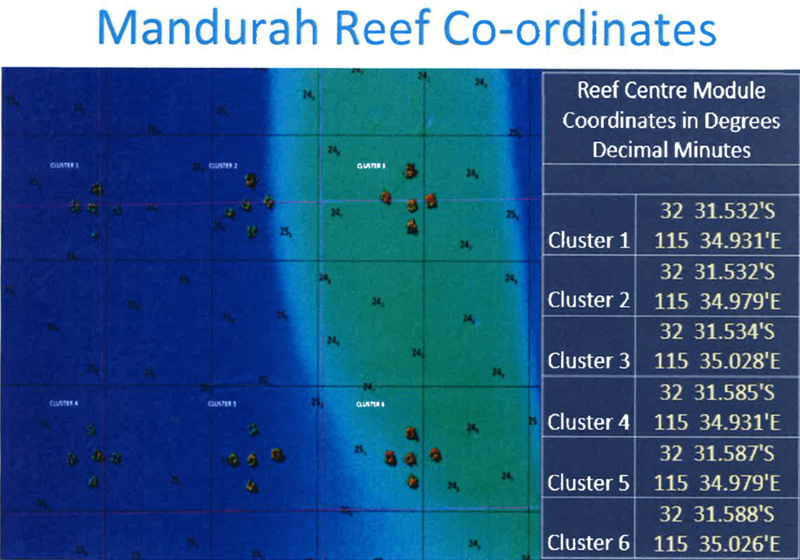 As the Mandurah reef has been constructed from the same modules and placed in a similar depths we are confident the Mandurah reef will experience the same success. It will take surprisingly little time for the new reefs to be inhabited by fish and colonised by algae, sponges and corals. Within two months of deploying the reefs off Dunsborough and Bunbury, pelagic species such as Samson Fish and Skippy were observed on the reefs as well as large amounts of bait holding up in the modules. In only 6 months, large amounts of algae had colonised the modules and demersal fish such as Dhufish were seen on the reefs. In just over a year, coralline algae, sponges and bryozoans appeared on the reefs. Now over 60 different fish species including slower colonisers such as Blue Groper, Octopus and Wobbegongs have been identified on these reefs. The Mandurah Artificial Reef is Australian made with the modules being designed by an Australian company called the Haejoo Group, built in WA at MJB industries in Australind, deployed by Perth based company Subcon Ptyltd who used staff and vessels from Total AMS. The local fishing community has had real ownership of the development of the reef as well as provide expert advice to maximise the fishing opportunities for everyone in the region. There is no doubt that the Mandurah fishing community will grow a sense of stewardship for the reef as it continues to develop. The reefs will also assist the broader local community by bringing benefits to local businesses and the economy by increased fishing tourism in the Peel Region. The artificial reefs provide not only an opportunity for ecological growth on the modules but also social and economic growth for the community.